Modern polyethylene non-flushing unit with holding tank, separate urinal, two roll toilet tissue dispenser and hand sanitizer. This unit has a flushing toilet, foot pedal operated sink, mirror, interior light, two-roll toilet tissue dispenser, paper towels and soap dispenser. 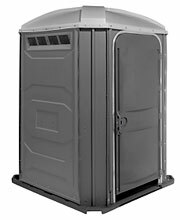 This is the top of the line in portable restrooms. Two self-contained units, mounted on a small trailer, with fresh water flushing toilets, sinks with running water, interior lights, mirrors, two-roll toilet tissue dispensers, paper towels and soap dispensers. Two and four station wash stand island complete with soap and paper towel dispensers. Optional warm water wash available. Requires electric. Ground level floor access. Wheelchair accessible. Available in flushing or non-flushing.